PITTSBURGH — At Forest Grove Elementary School, along the Ohio River just northwest of Pittsburgh, the Rust Belt is giving way to educational innovation. In a windowless room in the library, first- and second-graders experiment with a strange teaching device that’s half computer and half wooden play table. A giant computer screen looms over the table, and a touch-screen tablet is built into the table’s surface. A dancing cartoon gorilla appears on both screens, while a disembodied female voice commands two students to erect towers. The children reach into two bins of colorful wooden blocks and oversized Legos and build. Suddenly the table shakes wildly. The towers fall. Laughter ensues. The kids rebuild. The table shakes. The blocks topple again. The gorilla voice asks the children to place two different shapes on the earthquake table and guess which will fall first when the table shakes. A boy named Damon taps the picture of the smaller tower on the right side of the tablet screen. When the table shakes, the small tower remains standing. Damon’s classmate Lauren quickly taps the first of the four choices on the tablet screen without discussion, eager to get her hands on some blocks to start building again. Yannier’s research experiment is part of a partnership between Forest Grove’s school district and Carnegie Mellon to see if high-tech ideas can improve teaching and learning. Yannier calls her machine “mixed reality” — part digital and part analog at the same time. 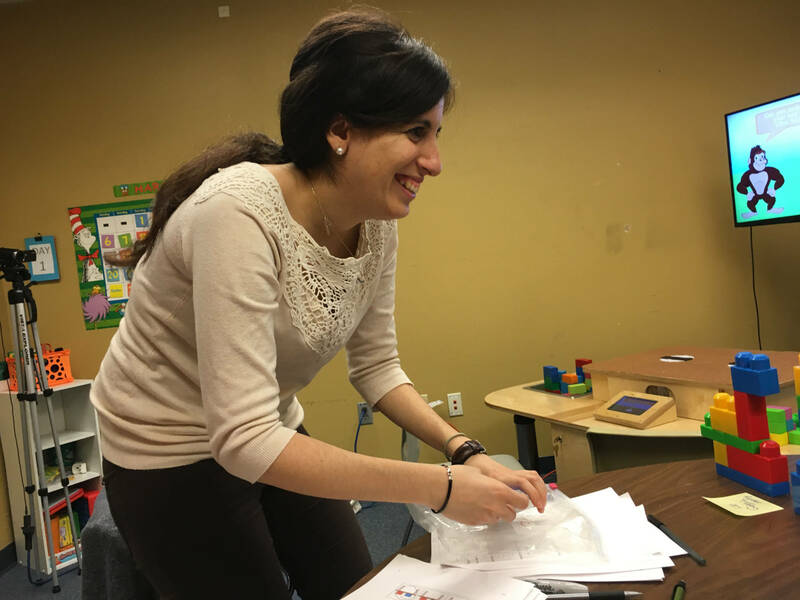 Her work is one of several research efforts to let children take advantage of the instant feedback that computerized instruction offers without losing the tactile joys and social interactions of the real world. 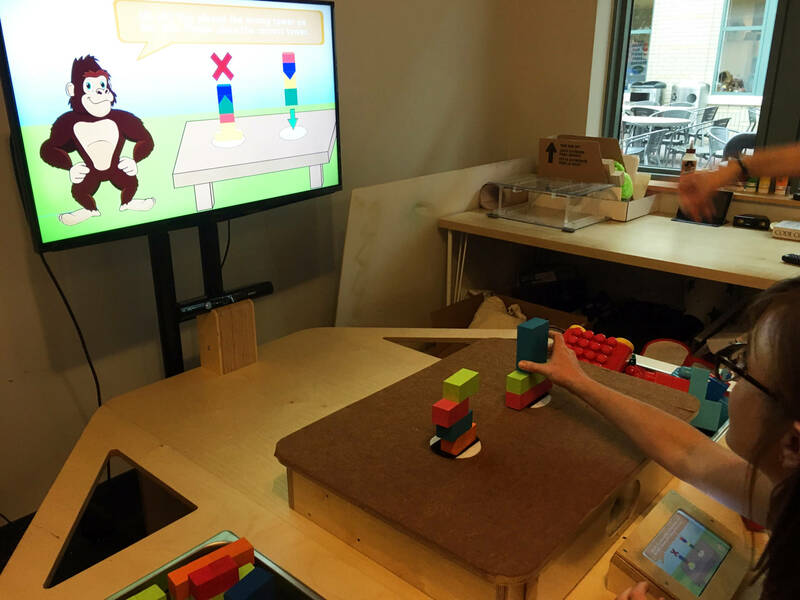 Some tech companies are also trying to mix hands-on play with digital learning. A company called Sphero, for example, has successfully marketed a ball to teach coding, geometry and genetics. Toymail has invented a two-way communications device that can be used to transmit lessons. Most of these efforts are essentially cute toys with educational uses. Yannier’s invention, by contrast, is a giant piece of furniture intended for schools and museums. With it, she joins a debate in education about whether or not very young children should be taught through computers at school, even some of the time. Advocates like the way that educational software can alert kids to their mistakes right away and help to fix them more quickly. Sophisticated programs can adjust to each student’s needs and pace, like a personal tutor. Teachers can get real-time feedback on what students are struggling with. Plus, video game animations can be so adorably entertaining. Kids love them. Yannier was deeply affected by a robotics competition in her native Turkey, where she coached underprivileged students to build and program a wheelchair. Her team won, and the motivating power of group work left an impression on her. She didn’t want to spend her career designing software that would result in students sitting silently with headphones in front of computers. So when she arrived as a Ph.D. student at Carnegie Mellon, Yannier decided to invent a new kind of educational machine with which kids could learn together. Hers would use a real table with real blocks — and a computer at the heart of it that uses motion sensors to “see” what students are doing. A camera transmits a near-infrared light to the objects on the table, and when the light bounces back, like sonar, it sends information back to the transmitter, which forms a 3-D image of what is on the table. Thus, the computer can “see” what shape the block towers are taking and whether or not they’re still standing. In 2015 she began testing her shaking table contraption to see how well young kids, ages 6 through 8, could learn basic physics principles from it. Yannier began with two lesson plans: one given to kids only on the computer; and one given to a different group of kids using her mixed-reality contraption. Both lessons guided students to discover concepts through a series of questions, rather than just teaching kids to memorize and regurgitate facts. She had the children take a test before and after the lesson to gauge how much they learned. She found that students learned five times as much using her machine as they did from solely using software on a flat computer screen. The astounding result surprised Yannier’s dissertation advisor, Ken Koedinger, because other Carnegie Mellon researchers had failed to find educational benefits from teaching middle-schoolers with actual objects (such as a stretchy spring) compared to computerized simulations. Koedinger speculated that older kids might be better able to process information on a flat screen than younger kids. “I do think our brains take some time to process a 2-D display,” Koedinger said. 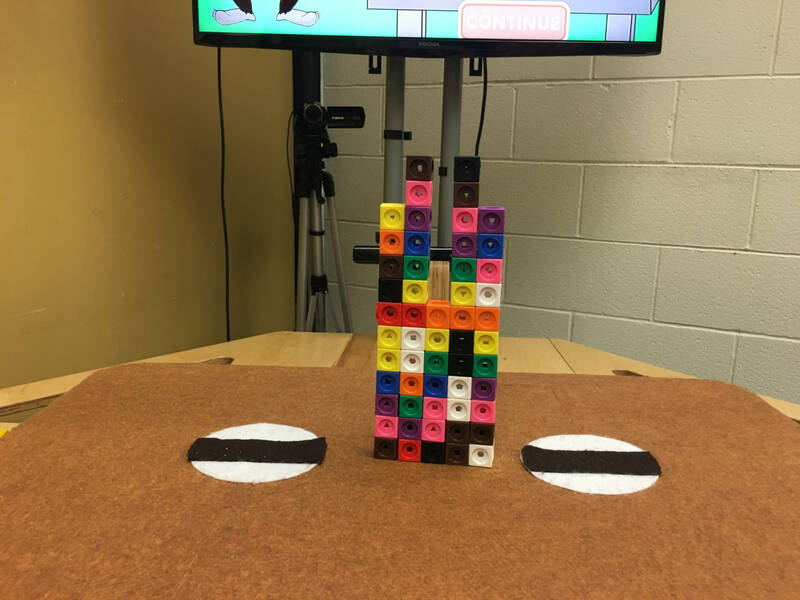 At the elementary school, the gorilla voice keeps Damon and Lauren on task, asking them to find wooden blocks that match the ones pictured on the screen and place them on the earthquake table. One is shaped like a lowercase ‘t,’ and the other is the same, but upside-down. Which one will fall? This turns out to be one of the hardest questions in the lesson. Koedinger, the professor, admits he got this one wrong when he tried it. He imagined his daughter’s arms extended out on the high beam to maintain balance in gymnastics class. But Damon and Lauren correctly guess that the upside-down ‘t’ will survive the tremors. “Good job,” the computer table says. In an earlier experiment with her machine, Yannier tested another long-debated educational theory: Do kids learn best individually, or collaboratively in pairs? She found that some students collaborated productively and had great learning gains. But others just distracted each other. When averaged, the two canceled each other out, and her results showed that, overall, collaborative learning was no better than solitary learning. In fact, a school district leader said that his favorite part of Yannier’s experiments was that they require students to work collaboratively, something he thinks will better prepare students for the workforce. So far, Yannier’s earthquake table seems like a joyful way to learn about centers of gravity, symmetry and balance. Could it be adapted to teach anything else, such as fractions? Yannier said she’s working on creating a table with a two-armed balance scale, which will be more conducive to math and physics instruction. Whether it will be as engaging as earthquakes and toppling blocks is another question. Another problem is size. The table and screen together are more than six feet wide, deep and tall. The machine looks more like a museum installation than classroom equipment. 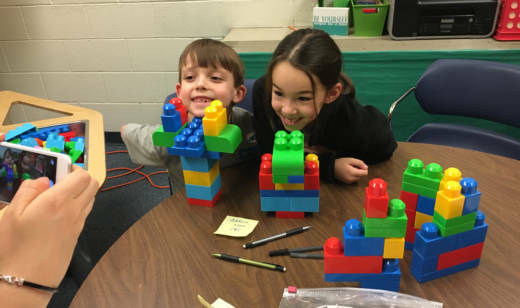 Moreover, it’s not a very efficient teacher, since only two kids can build towers at a time, and, at the moment, it requires an adult’s constant presence to set things up and deal with technical glitches. Yannier has added wheels and folding wings to her contraption to make it portable, so that it can be used in a classroom as kids rotate through different stations. And she wants to add an intelligent tutoring system, to personalize instruction so that more advanced kids can be given more advanced tasks and challenges. Yannier might be onto something. After more than an hour of lessons, and pre-tests and post-tests, Damon and Lauren don’t want to leave the table. “Me have great idea,” Damon says in an Elmo voice, and asks if they can keep building. The two build an enormous structure with a giant cantilever arm. It falls before the earthquake even hits. Then they tinker some more and build another beast — still with a cantilever arm, but this time with a much larger base. It miraculously withstands six seconds of shakes. “It’s cool,” Damon declares. Indeed, it is.